In my previous post I argued for a revisionist approach to art history, favoring discarded art historical movements related to the grotesque and the fantastic. I called for a start of art history with the work of Bosch rather than Da Vinci. I realized when writing it that I sort of short-changed da Vinci since the latter has also made many lesser-known works including several grotesques  and caricatures. 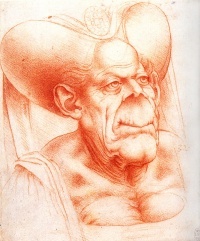 See the book Leonardo Da Vinci: The Divine and the Grotesque by Martin Clayton. The reason I short-changed da Vinci is that he is much better known for “mainstream” works such as the Mona Lisa and Vitruvian Man. 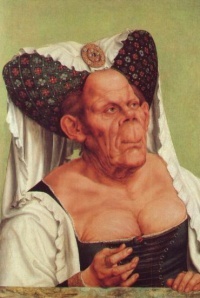 While researching da Vinci’s relation to the grotesque I came up with Grotesque Head, a powerful caricature which is clearly the inspiration for Quentin Matsys‘s The Ugly Duchess. Enjoy. This entry was posted in aesthetics, art, culture, European culture, genre, irrationalism, Northern Renaissance, sensibility, subversion, theory, transgression, uncanny, visual culture on February 18, 2008 by jahsonic. I would never “Give up” on Leonardo, he is one of my favourite artists and as much an influence on me as Bosch. My art history revisionism is not to dismiss artists who are known, but recognise artists who have been ignored. I was in a university library recently, there were shelves of books on Picasso but not one book on Kubin. There are many artists who I want books about, but these books do not exist. Look up Picasso on Amazon and you get 2378 results. How many books do we need on Picasso? If you read my essay and try to find books on the artists I mention you will not find many, and those you do find will be very expensive.